Digital Marketing is one of the best businesses in the industry. With the increasing trend of the digital age, everyone wants to grab an opportunity in this field. Marketing Business Summit will definitely help you learn digital marketing business well. 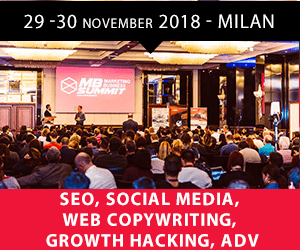 Marketing Business Summit will be held for the 3rd time in Milan, Italy on 29th and 30th November 2018. The event will have large number of gatherers which will help you understand the changes in the digital marketing business. The event will witness the International speakers for the first time in Italy with double and simultaneous translation with the international audience. This is not just the web marketing conference but more than that. The event wouldn’t just cover digital marketing but also Online Business, Coaching & Motivation, the Right of the Network. It will have large gathering of the speakers from international and local platforms. The event will be held at the Hotel Michelangelo of Milanospeaker. It will gather speakers which will present case studies and practical examples, strategies, methods, and visions to increase their business. The speakers’ speech will be translated from Italian to English and vice-versa. The participants from Europe will join the conference. It will cover topics such as SEO and Social Media Marketing, FacebookAds, in the world of e-commerce and many other topics of online marketing, in the form of strategies, methods, and case studies of great professionals. But the Marketing Business Summit is not just Web Marketing: the event will also be discussing business and entrepreneurship with a speaker of the calibre of Alfio Bardolla and Sonia Peronaci and personal growth, with the coach as Sebastiano Zanolli, Claudio Belotti and Taz Thornton. Register for the Marketing Business Summit Now!! Use Coupon code ” affiliate” and get 50€ discount on your Ticket.